vector map with two attributes for each administrative unit: density (number of people per km2) and population inside polygons – city, municipality, region, state etc. Population Maps are based on precise and up-to-date clutter classification of 2-5 m resolution for cities and 10-20 m for other areas, administrative division and census data. The source, vintage and detail of administrative boundaries for population vary from project to project based on available information for a requested country. We always use the latest available data, but where it is not possible, we add an official forecast of population quantity for a current year or extrapolate available figures. Visicom Population Maps provide important and valuable information for traffic planning, capacity simulations and network dimensioning, optimization of the networks and improving the network infrastructure when new technologies are deployed. 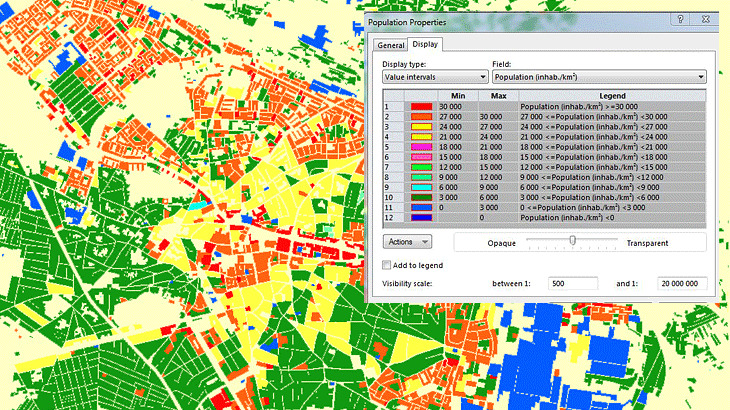 Download brochure for information about available Population Maps.